Here's some outrage to start your week off: One of a South Carolina prison inmate's twins drowned in a toilet in 2012 after guards refused to help her during childbirth, The State reports. Lawsuits allege that the S.C. Department of Corrections is failing to meet inmates' basic health care needs. "Medicare for All" could end up costing employers less than the current employer-sponsored health insurance system does, depending on how it's structured. But that certainly doesn't mean employers are on board, partially because other concerns — like access to health care and the competitive advantage that generous benefits can create — may outweigh cost and convenience. What they're saying: Employers provide health insurance "because it’s a benefit that attracts employees. It’s a benefit they like to provide, even if it’s expensive," said Neil Bradley of the U.S. Chamber of Commerce. Bradley said that things like choice and access to medical care — which he said would be hindered under Medicare for All — are more important to employers. The other side: "I’ve talked to a Fortune 500 CEO who says he would love [Medicare for All] and who told me he knows plenty of others who feel that way," said House Budget Committee chairman John Yarmuth (D-Ky.). By the numbers: Health benefits made up 8.3% of employee compensation in 2019, according to the Bureau of Labor Statistics. This translates into 12% of payroll, or of wages and salaries. But most economists assume that workers end up shouldering the cost of their employer insurance today through reduced wages and that would continue if premiums were replaced with a tax to fund Medicare for All. Biosimilars aren't creating competition that's effective enough to meaningfully bring down the cost of biologics, a group of researchers write in Health Affairs in a two-part blog. That's partially because biologics — which are more complicated than small-molecule drugs — are natural monopolies. "The hindrances to competitive entry are a structural feature of biologics themselves," the authors write. Instead, biologics' prices should be regulated once their market exclusivity period ends, they argue. If this approach had been implemented in 2018, it could have saved $250–$300 billion over 5 years. The Affordable Care Act created a pathway for biosimilars to come to market under the presumption that they'd work like generics to create competition against biologics. But that hasn't been the case. As of March, there have only been 29 biosimilar applications submitted to the FDA. Only 18 have been approved, and 10 remain unmarketed. "In those cases where biosimilars have been introduced, competition has been thin and price reductions modest," the authors write. Over the long term, the outlook isn't much better. Why it matters: Biologics are some of the most expensive drugs on the market today. If competition isn't going to bring those prices down, something else will eventually have to be done. Johnson & Johnson and UnitedHealth Group are lighting the Q1 earnings torch this week, per usual, Axios' Bob Herman reports. But Wall Street investors are uneasy about the industry’s forecast even though companies are still immensely profitable right now. 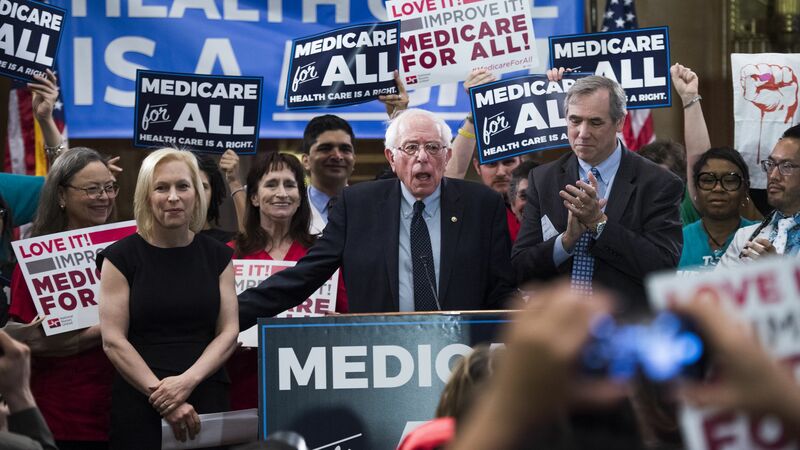 Driving the news: “Medicare for All” legislation, the Trump administration’s drug rebate regulation and another legal battle over the Affordable Care Act have created volatility with health care stocks, which have traded below the broader market. Go deeper: Our health care earnings tracker is updated. Come follow along so Bob isn’t so lonely. Details: A low-income family with a marketplace plan pays 8.4% of their income on premiums and out-of-pocket costs, compared to 14% for a lower-wage family with employer coverage (those with incomes below twice the poverty level). Keep in mind that employer coverage doesn’t have the same kind of income-based subsidies that ACA plans have. The bottom line: It’s another example of how the constant focus on the ACA leads us to lose sight of real issues with employer coverage, where far more people get their health insurance. Business Insider reports on a mysterious illness associated with marijuana use and what it means for the drug's safety as its legalization spreads. The Daily Beast and Kaiser Health News dig into the rise of syphilis in rural America. An American researcher is being investigated by Stanford for his communication with the Chinese scientist responsible for the birth of gene-altered twins last year, the NYT reports.